The West appears, suddenly, devoid of its greatest virtues, constructed century after century, preoccupied now only with reproducing its own defects and with copying the defects of others, such as authoritarianism and the preemptive persecution of innocents. Virtues like tolerance and self-criticism have never been a weakness, as some now pretend, but quite the opposite: it was because of them that progress, both ethical and material, were possible. Both the greatest hope and the greatest danger for the West can be found in its own heart. Those of us who hold neither “Rage” nor “Pride” for any race or culture feel nostalgia for times gone by, times that were never especially good, but were not so bad either. From this perspective of Western Superiority, the very famous Italian journalist Oriana Fallaci wrote, recently, brilliant observations such as the following: “If in some countries the women are so stupid as to accept the chador and even the veil, so much the worse for them. (…) And if their husbands are so idiotic as to not drink wine or beer, idem.” Wow, that is what I call intellectual rigor. “How disgusting!” – she continued writing, first in the Corriere della Sera and later in her best seller The Rage and the Pride (Rizzoli International, 2002), referring to the Africans who had urinated in a plaza in Italy – “They piss for a long time these sons of Allah! A race of hypocrites.” “Even if they were absolutely innocent, even if there were not one among them who wished to destroy the Tower of Pisa or the Tower of Giotto, nobody who wished to make me wear the chador, nobody who wished to burn me on the bonfires of a new Inquisition, their presence alarms me. It makes me uneasy.” Summing up: even if these blacks were completely innocent, their presence makes her uneasy anyway. 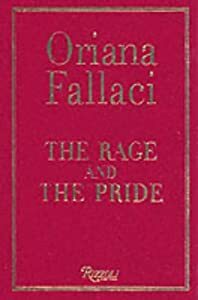 For Fallaci, this is not racism; it is “cold, lucid, rational rage.” And, if that were not enough, she offers another ingenious observation with reference to immigrants in general: “And besides, there is something else I don’t understand. If they are really so poor, who gives them the money for the trip on the planes or boats that bring them to Italy? Might Osama bin Laden be paying their way, at least in part?” …Poor Galileo, poor Camus, poor Simone de Beauvoir, poor Michel Foucault. Incidentally, we should remember that, even though the lady writes without understanding – she said it herself – these words ended up in a book that has sold a half million copies, a book with no shortage of reasoning and common sense, as when she asserts “I am an atheist, thank God.” Nor does it lack in historical curiosities like the following: “How does one accept polygamy and the principle that women should not allow photographs to be taken of them? Because this is also in the Q’uran,” which means that in the 7th century Arabs were extremely advanced in the area of optics. Nor is the book lacking in repeated doses of humor, as with these weighty arguments: “And, besides, let’s admit it: our cathedrals are more beautiful than the mosques and synagogues, yes or no? Protestant churches are also more beautiful.” As Atilio says, she has the Shine of Brigitte Bardot. As if what we really needed was to get wrapped up in a discussion of which is more beautiful, the Tower of Pisa or the Taj Mahal. And once again that European tolerance: “I am telling you that, precisely because it has been well defined for centuries, our cultural identity cannot support a wave of immigration composed of people who, in one form or another, want to change our way of life. Our values. I am telling you that among us there is no room for muezzins, for minarets, for false abstinence, for their screwed up medieval ways, for their damned chador. And if there were, I would not give it to them.” And finally, concluding with a warning to her editor: “I warn you: do not ask me for anything else ever again. Least of all that I participate in vain polemics. What I needed to say I have said. My rage and pride have demanded it of me.” Something which had already been clear to us from the beginning and, as it happens, denies us one of the basic elements of both democracy and tolerance, dating to ancient Greece: polemics and the right to respond – the competition of arguments instead of insults. Is it really necessary to remind Fallaci that among all of that and all of us one finds the ancient Islamic Empire, without which everything would have burned – I am talking about the books and the people, not the Coliseum – thanks to centuries of ecclesiastical terrorism, quite European and quite Western? And with regard to the grandeur of Rome and “its conception of the Law” we will talk another day, because here there is indeed some black and white worth remembering. Let’s also set aside for the moment Islamic literature and architecture, which have nothing to envy in Fallaci’s Rome, as any half-way educated person knows. The fatal answer: behind our science one finds the Egyptians, the Caldeans, the Hindus, the Greeks, the Chinese, the Arabs, the Jews and the Africans. Or does Fallaci believe that everything arose through spontaneous generation in the last fifty years? She needs to be reminded that Pythagoras took his philosophy from Egypt and Caldea (Iraq) – including his famous mathematical formula, which we use not only in architecture but also in the proof of Einstein’s Special Theory of Relativity – as did that other wise man and mathematician Thales. Both of them traveled through the Middle East with their minds more open than Fallaci’s when she made the trip. The hypothetical-deductive method – the basis for scientific epistemology – originated among Egyptian priests (start with Klimovsky, please), zero and the extraction of square roots, as well as innumerable mathematical and astronomical discoveries, which we teach today in grade school, were born in India and Iraq; the alphabet was invented by the Phoenicians (ancient Lebanese), who were also responsible for the first form of globalization known to the world. The zero was not an invention of the Arabs, but of the Hindus, but it was the former who brought it to the West. By contrast, the advanced Roman Empire not only was unfamiliar with zero – without which it would be impossible to imagine modern mathematics and space travel – but in fact possessed an unwieldy system of counting and calculation that endured until the late Middle Ages. Through to the early Renaissance there were still businessmen who used the Roman system, refusing to exchange it for Arabic numerals, due to racial and religious prejudices, resulting in all kinds of mathematical errors and social disputes. Meanwhile, perhaps it is better to not even mention that the birth of the Modern Era began with European cultural contact – after long centuries of religious repression – first with Islamic culture and then with Greek culture. Or did anyone think that the rationalism of the Scholastics was a consequence of the practice of torture in the holy dungeons? In the early 12th century, the Englishman Adelard of Bath undertook an extensive voyage of study through the south of Europe, Syria and Palestine. Upon returning from his trip, Adelard introduced into under-developed England a paradigm that even today is upheld by famous scientists like Stephen Hawking: God had created Nature in such a way that it could be studied and explained without His intervention. (Behold the other pillar of the sciences, rejected historically by the Roman Church.) Indeed, Adelard reproached the thinkers of his time for having allowed themselves to be enthralled by the prestige of the authorities – beginning with Aristotle, clearly. Because of them he made use of the slogan “reason against authority,” and insisted he be called “modernus.” “I have learned from my Arab teachers to take reason as a guide – he wrote – but you only adhere to what authority says.” A compatriot of Fallaci, Gerardo de Cremona, introduced to Europe the writings of the “Iraqi” astronomer and mathematician Al-Jwarizmi, inventor of algebra, of algorithms, of Arabic and decimal calculus; translated Ptolemy from the Arabic – since even the astronomical theory of an official Greek like Ptolemy could not be found in Christian Europe – as well as dozens of medical treatises, like those of Ibn Sina and Irani al-Razi, author of the first scientific treatise on smallpox and measles, for which today he might have been the object of some kind of persecution. As Freud and Jung used to say, that act which nobody would desire to commit is never the object of a prohibition; and as Boudrillard said, rights are established when they have been lost. The Islamic terrorists have achieved what they wanted, twice over. The West appears, suddenly, devoid of its greatest virtues, constructed century after century, preoccupied now only with reproducing its own defects and with copying the defects of others, such as authoritarianism and the preemptive persecution of innocents. So much time imposing its culture on the other regions of the planet, to allow itself now to impose a morality that in its better moments was not even its own. Virtues like tolerance and self-criticism never represented its weakness, as some would now have it, but quite the opposite: only because of them was any kind of progress possible, whether ethical or material. Democracy and Science never developed out of the narcissistic reverence for its own culture but from critical opposition within it. And in this enterprise were engaged, until recently, not only the “damned intellectuals” but many activist and social resistance groups, like the bourgeoisie in the 18th century, the unions in the 20th century, investigative journalism until a short time ago, now replaced by propaganda in these miserable times of ours. Even the rapid destruction of privacy is another symptom of that moral colonization. Only instead of religious control we will be controlled by Military Security. The Big Brother who hears all and sees all will end up forcing upon us masks similar to those we see in the East, with the sole objective of not being recognized when we walk down the street or when we make love. A few years ago I was in the United States and I saw there a beautiful mural in the United Nations building in New York, if I remember correctly, where men and women from distinct races and religions were visually represented – I think the composition was based on a somewhat arbitrary pyramid, but that is neither here nor there. Below, with gilded letters, one could read a commandment taught by Confucius in China and repeated for millennia by men and women throughout the East, until it came to constitute a Western principle: “Do unto others as you would have them do unto you.” In English it sounds musical, and even those who do not know the language sense that it refers to a certain reciprocity between oneself and others. I do not understand why we should scratch that commandment from our walls – founding principle for any democracy and for the rule of law, founding principle for the best dreams of the West – simply because others have suddenly forgotten it. Or they have exchanged it for an ancient biblical principle that Christ took it upon himself to abolish: “an eye for an eye and a tooth for a tooth.” Which at present translates as an inversion of the Confucian maxim, something like: do unto others everything that they have done to you – the well-known, endless story.